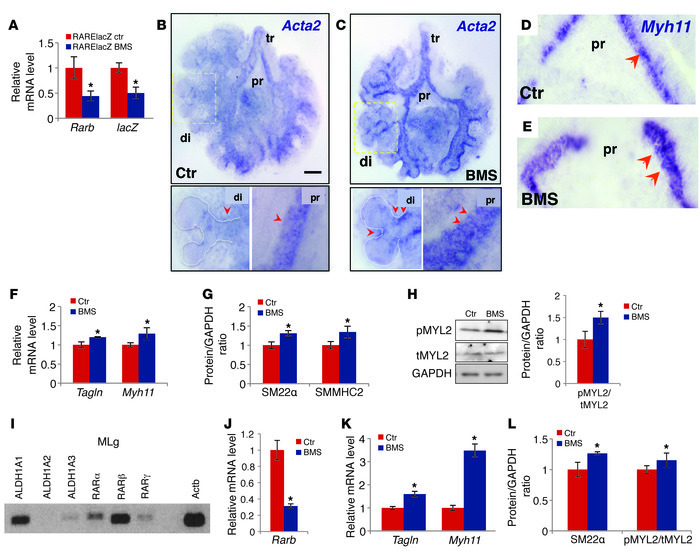 Disruption of RA signaling leads to aberrant expression of SM markers in mouse embryonic lung explant (A–H) and MLg cell (I–L) cultures. BMS-treated RARElacZ lungs (48 hours): significant downregulation of Rarb and RARElacZ (A) and increased expression of Tagln and Myh11 (F) and their products SM22α and SMMHC2, respectively) (G). (B–E) Whole-mount ISH of Acta2 (B and C) and Myh11 (D and E) increased signals in the mesenchyme of proximal (pr) and distal (di) airways in BMS-treated lungs compared with those of controls (arrowheads). Strong ectopic Acta2 expression was seen in stalks of distal buds in BMS-treated lungs. (H) Increased ratio of pMYL2/tMYL2 in BMS-treated lungs. (I) PCR detection of RA pathway components in MLg cells: RA-synthesizing enzymes (ALDH1A1, -2, and -3) and RA receptors (RARα, RARβ, and RARγ). (J–L) BMS treatment (24 hours) disrupted RA signaling (downregulation of Rarb) and increased expression of SM marker genes (Tagln and Myh11) and products (SM22α) and of the pMYL2/tMYL2 ratio. (A, F, I, and K) PCR and (G, H, and L) Western blot analysis. n = 3–4 per condition. *P < 0.05. tr, trachea. Scale bar: 200 μm.